Livingston Associates Landscape Architecture and Planning, located in San Diego, California, strives to provide clients with functional, innovative design solutions that are aesthetically comforting. It is our mission to service clients by guiding them through an extensive design process, achieving livable design solutions while emphasizing sustainability. Designs are envisioned and created from criteria provided by the client and existing site conditions while effectively considering project budget. 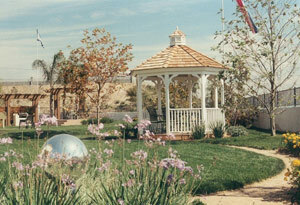 Livingston Associates of San Diego, California, has provided its expertise in the landscape architectural field since August 1985. Douglas E. Livingston, principal, services clients in both California and Arizona, with emphasis in drought tolerant plant material and water efficient irrigation designs for government, commercial, industrial, civic and residential projects. Livingston Associates responds to client needs and community influence through effective communication. This special effort, to meet in collaboration with the clients and other design disciplines, is the initial source of a successful project. With this beginning step, we respond to the community and/or client, designing a project that functions, offering positive aesthetic qualities. Livingston Associates services the needs of clients in a variety of ways through water conservation, proper budgeting / value engineering, vandal resistance and easy maintenance designs. As stewards of the land, we apply important water conservation practices through the use of properly located plant materials considering specific site and environmental conditions, selection of plant material that are drought tolerant and by the utilization of automatic, efficient, low precipitation irrigation systems with sensory override controls. Call us at 619-583-4166 or contact us online for all your landscape architecture needs. Serving Southern California including San Diego, Rancho Santa Fe, La Jolla, Poway, Encinitas, Coronado, Del Mar, Irvine, Riverside and Arizona including Yuma, Tucson, Phoenix.